I'd say thats a pretty good stack of wood for a Saturday afternoon. There is more behind what you can see. Steve is amazing. 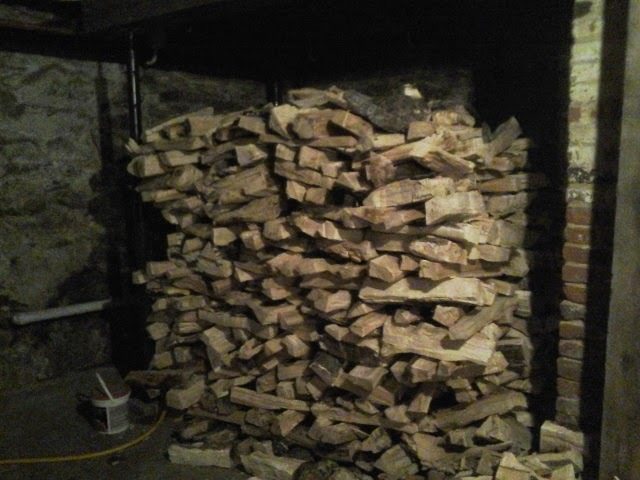 He stacked this in the cellar with a fan blowing on it because we have had lots of wet wood that is hard to burn. Why make vinegar, you ask? Well, vinegar has lots of uses. maybe you want to make your own salad dressing. or maybe you have heard of the awesome "fire cider"tonic and think you would like some to help fight colds and flu. or, you ran out of windex and need to clean your mirrors or countertops. you need to disinfect some surfaces. you want your hair to look awesome and shiney. you are on the Paleo diet and want to cook up some bone broth. your dog has ear mites amd you need to clean out his ears..
you have 473 pounds of apples sitting around..
TO MAKE VINEGAR YOU FIRST HAVE TO MAKE ALCOHOL. Thats right... all vinegar starts with alcohol. So, making your own apple cider vinegar means you start by making hard apple cider. Its required! 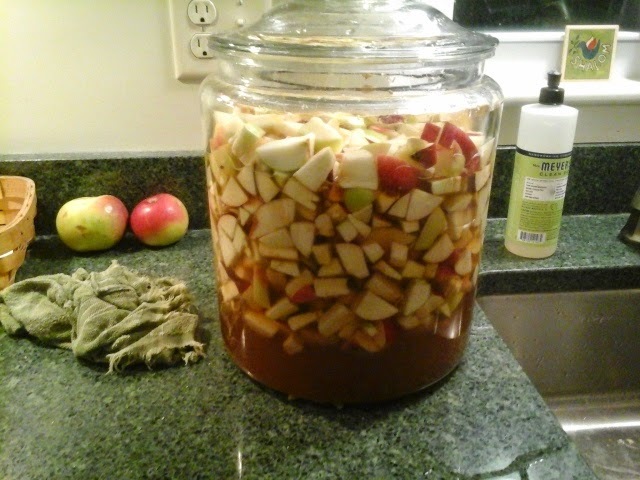 You: Hey hon, I am going to make some apple cider vinegar. Your SO: ( yawn) thats nice. You: But first i have to brew some hard cider. Your SO: Cool! Need some help? So, I would usually start with fresh apple juice. But this batch is a bit of an experiment. After all, our great great grandmothers didnt have any fancy schmancy juicer. I am gonna try this with just chopped up apples. Will it work? I dont know! 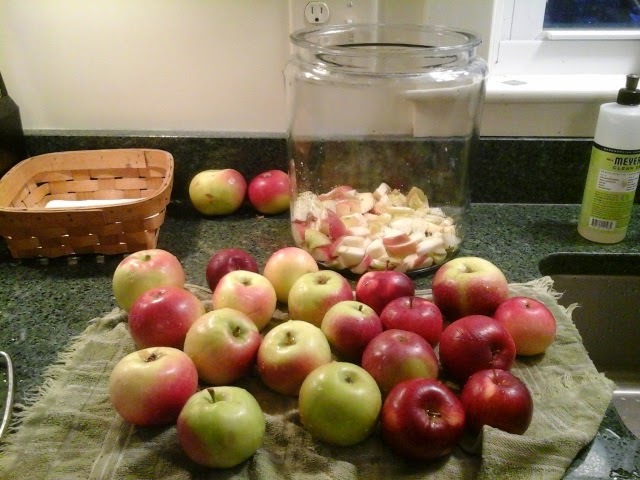 And, I should add that I am not making a batch of hard cider that I plan on drinking-its just for vinegar making-so I am not too concerned about sterilizing everything and measuring everything, etc. 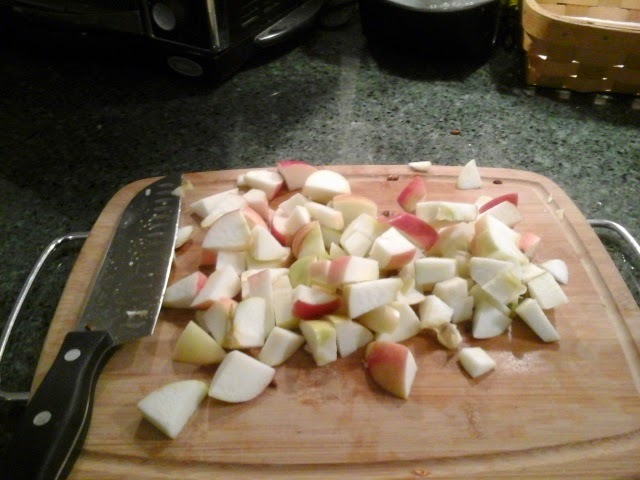 I just chop these up, peel, cores, stems and all, into small one inch pieces. They are going into a large glass jar i have. I filled it till it was a bit over half full. For alcohol to ferment, there needs to be enough sugar to allow the yeast to grow. The apples have some, but maybe not enough. 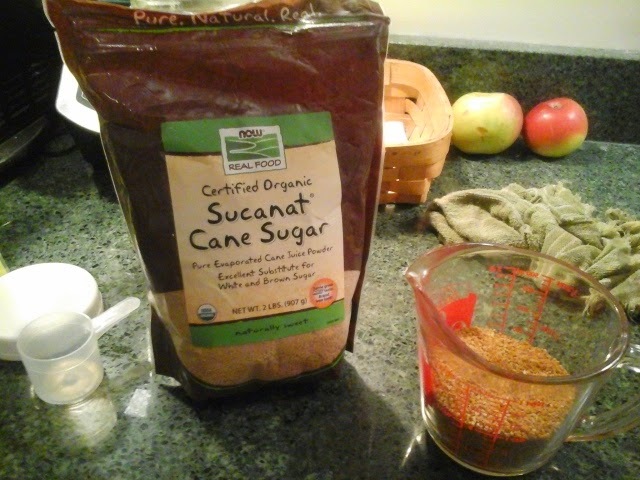 So I add some natural sugar.The yeast will eat the sugar, and the by-product is alcohol. Who says fungi are not our friends? 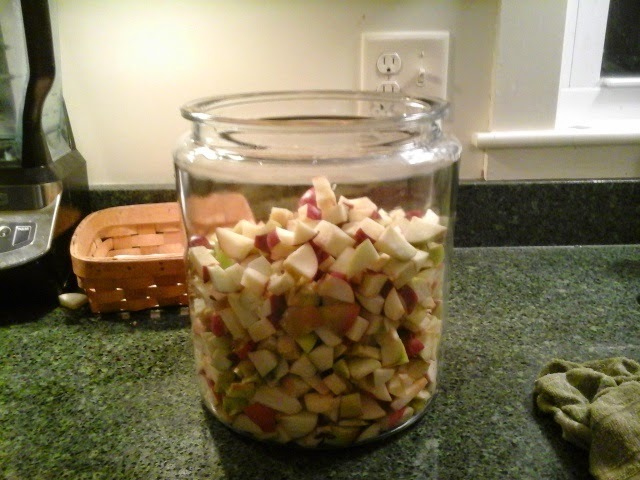 I add about two cups of sugar and enough water to cover the apples, and still leave an inch or two of head room. I also added about a tablespoon of yeast.. not bread yeast, though that might work if its all you have, but some ale yeast. The difference is that ale yeast is just better at eating fruit sugars. There are enough wild yeasts floating around in your kitchen that you probably would get fermentation without adding any. This just gives a jump start. If I were making apple cider that I wanted to drink, I would be lots more picky, and sterilize everything, and keep it in an airtight container to avoid contaminatiom. This vinegar just needs fermented apple juice. Not too worried about taste, so i am pretty relaxed about the whole process. If everything goes according to plan, these apples will begin to ferment and bubble away, and after a couple of weeks, will be apple cider. Then we will move on to the next step in making vinegar. Exciting stuff.. please control your enthusiasm. Weather today. Still freaking cold. Was low single digits, I forget. But nice and sunny. Pretty on the new snow. wildlife-a bunch of 5K road runners. Exercise-a local 5K race on snowy roads, followed by another hour of easy running in the snow. It was 8 degrees when we started. My chin was numb.